This opportunity caused us to fundamentally rethink our business model, with a focus on creating something future forward. Advertising agency Ignited extended its brand presence with the design and development of El Camp, a one-of-a-kind co-working community located in El Segundo, Calif. Dedicated to a single industry sector—companies in the marketing profession—the facility has a distinct summer camp vibe, from the picnic table-like workstations to the outdoor barbeque and fireplaces. Represented by Savills Studley Corporate Managing Director Robert Cavaiola, Ignited leased a 55,000-square-foot former aerospace manufacturing facility at 2150 Park Place. The converted creative project, which is across the street from the agency’s previous location, has been extensively renovated and features an expansive indoor/outdoor area, high ceilings, excellent parking and is walking distance to local amenities. The result is El Camp, “A Creative Community Built by the Power of Curiosity,” that houses Ignited’s Los Angeles offices as well as more than 20 companies within the marketing profession. “Our vision was to curate a mix of complementary organizations and services, with the overall goal of working together to help each other and our clients prosper,” explained Eric Johnson, President of Ignited. El Camp has been designed to evoke that warm, embracing feeling, with walls and floors in earth tones, furniture made from reclaimed wood instead of metal, and shade trees and fire pits in the outdoor spaces. The summer-camp atmosphere encourages Ignited and its tenants – known as “campers” – to share ideas and experiences, across teams and with other businesses, in a truly collaborative environment. The concept has proved so successful that after less than one year, El Camp is nearly 100% occupied. There is no physical separation between companies and the space is very flexible, with the ability to easily add or subtract people and desks. Other onsite amenities include production and recording studios, in-house edit bays, and a library hideaway. Ignited is an independent advertising agency, founded in 1999, that works with brands seeking to transform their business through digitally connected marketing. The agency focuses on clients seeking strategy, creative and media services. Ignited is headquartered in its newly created El Camp co-working space in El Segundo, California. 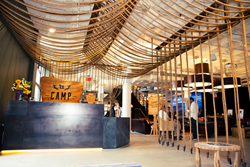 El Camp was created to provide a collaborative workspace for marketing service businesses, and has 21 member companies. Ignited clients include Turtle Beach, Trion, Activision, PLDT, U.S. Security & Exchange Commission, On-Lok and Jollibee, among others. For more information, please visit http://www.ignitedusa.com.